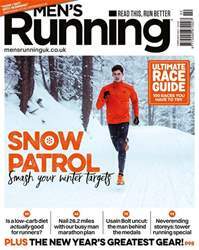 For any of you reading this magazine for the first time, I hope this will be the beginning of a long and exciting journey, both with MR and with running. For me, though, it’s also an ending of sorts: this is my last issue as editor of the magazine (sob, sob). From narrowly beating a steam train over 14 miles to being trounced by a horse over 24, via near-death at the Ennerdale Horseshoe and elation at the London Marathon, it’s been quite the three years. The best part, though, has been interacting with the MR community, in person and online, and hearing about the countless ways in which running has improved your lives. From weight-loss heroes to those who have used running to improve their mental health, ours is a sport filled with inspiring stories of self-improvement. When I spoke with Paul Sinton-Hewitt recently, the founder of parkrun told me he started the event because “I wanted to be with people – and running is about people.” And what a strange, brilliant, eclectic bunch we are. Having the chance to meet many of you, and put together a magazine about a subject as universal and life-changing as running, has been a great privilege. Thanks for reading.